Would you like a new, elegant theme for your Tumblr blog? One of my favorite WordPress theme sites, Elegant Themes, has just started porting their new Tumblr-style WordPress themes to Tumblr. Let’s look at their first Tumblr theme, DailyNotes, and how to set it up on your Tumblr blog. In the past several weeks, I’ve written a number of articles at How-to Geek on Getting Started with Tumblr. I’ve really enjoyed using Tumblr, and think it’s one of the easiest ways to make a blog right now. 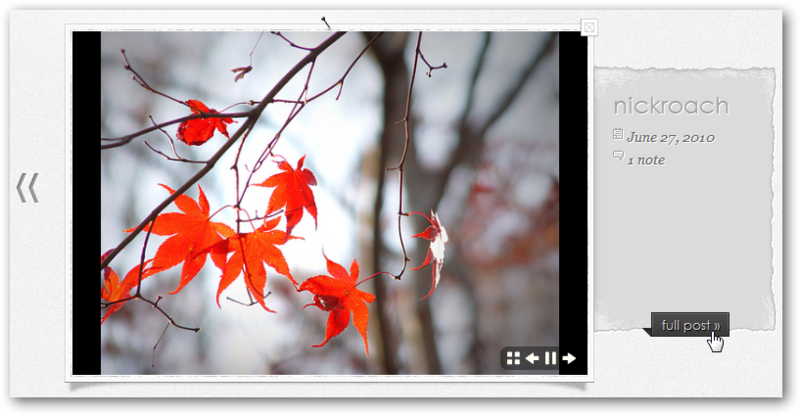 It’s much simpler than WordPress, and there are tons of beautiful Tumblr themes available. The only problem is, most of the best themes are used on thousands of Tumblr. 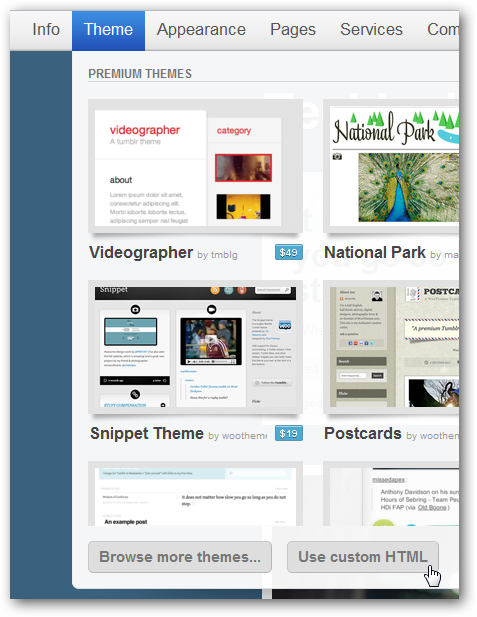 There’s a nice selection of Premium themes on Tumblr, but what if you want something more exquisite? Elegant Themes is a great option to make your WordPress blog stand out, and now you can use their themes to make your Tumblr blog stand out, too! Elegant Themes currently only offers one Tumblr theme which has just been released, but they promise to offer more in the future. The first theme, DailyNotes, is a beautiful way to make your Tumblr blog more useful and readable. It shows thumbnails of your recent posts on the front page. Hover over them, and a small icon will appear showing the type of post. Click one of the thumbnails to see the full post slide in with a nice, smooth animation. You’ll be able to see info about the post, and can click the Full Post button to see comments, notes, and more. Or, click the arrows on both sides of the post to see previous or later posts. We’re planning on launching a new Tumblr-powered blog soon with the DailyNotes theme, but for now you can check out the DailyNotes Live Demo site to see it in action. If you’d like to use DailyNotes on your Tumblr blog, you’ll need to signup for an Elegant Themes subscription. For $39/year, you’ll have access to all of their WordPress and Tumblr blog themes which you can use on as many of your own sites as you want. If you hit any problems with their themes, we’ve found their support forums very helpful, even when we were trying to add functionality or tweaks to their themes. And, if you only want to download the theme you want and then cancel your subscription, you can do that as well. Head to the link below to start signing up! 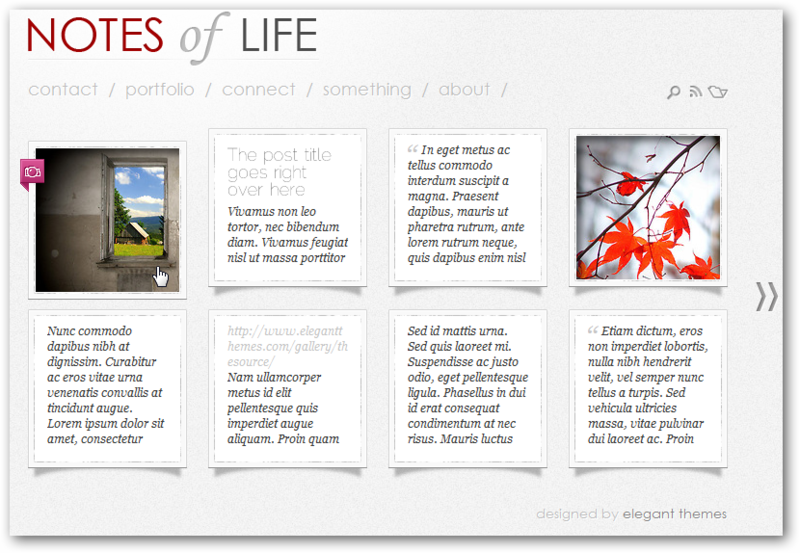 Sign up for Elegant Themes today! Once you’ve signed up, login to your account from the Members link with your username and password. All the themes are listed in alphebetical order, so scroll down to DailyNotesTumblr. Click the bullet, and then click the green Download File button. Save the zip file where you want; it should download fairly quick, as it’s a less than 40Kb download. Once it’s downloaded, unzip the file and open the new folder. 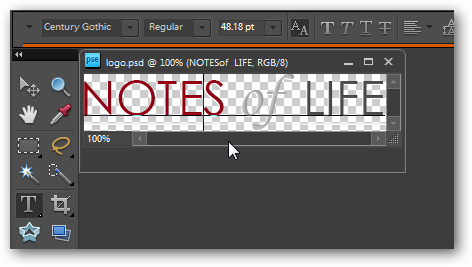 Select index.html, and open it with your favorite web editor or text editor such as Notepad. 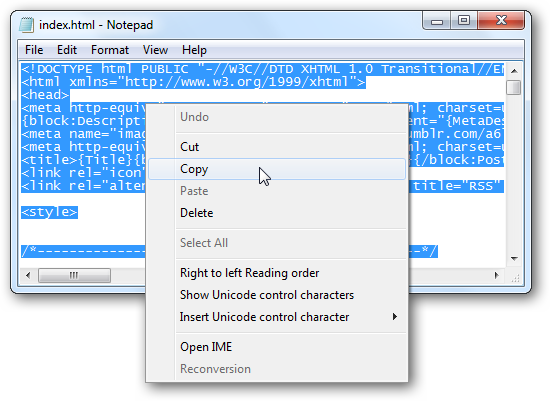 Select all of the text, and copy it to your clipboard. 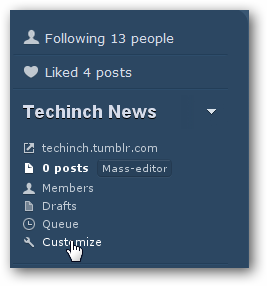 Now login to your Tumblr dashboard, and select Customize from the right hand side. 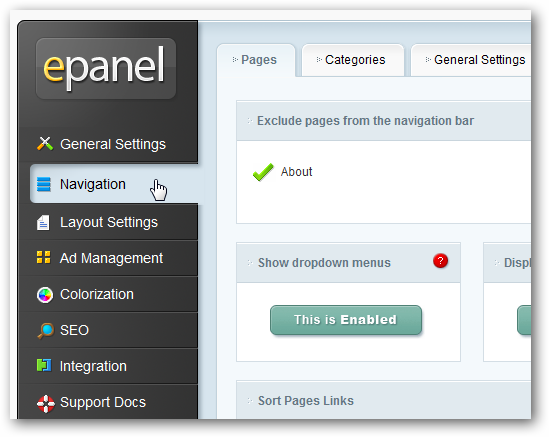 Select the Theme tab, and then select Use Custom HTML. Now, select all of the text in this box, delete it, and paste in the text you copied from the index.html file previously. 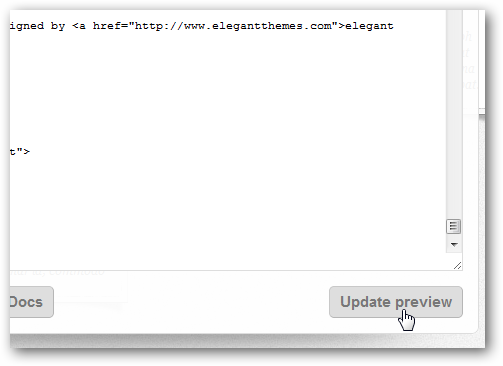 Select Update preview to see the new theme in action with the example content. The Theme includes a PSD of the logo, so you can edit it with your Tumblr blog’s name. Open it in Photoshop or another program that can edit PSD files such as Expression Design or Gimp, and edit it as you like. Alternately, of course, you could make your own unique logo if you want. The original is 302x57 px, so you might want to keep it within the same dimensions. Once you’re done, save the file as a PNG picture. Back in the Tumblr dashboard, select the Appearance tab and click Upload to add your own logo. Select the PNG file you created previously. Once you’re done, click Save+Close to apply your new theme and logo. Enjoy! Use DailyNotes on WordPress, too! If you’re still blogging on WordPress, you can use the beautiful DailyNotes, as well as dozens of other themes from Elegant Themes directly on your WordPress blog. They offer a couple micro-blog, Tumblr style themes that you can use on WordPress, in addition to their many blog-style and more complex CMS-style themes. Once you subscribe, you can use any or all of the themes on your sites, so if you maintain multiple sites you could use different Elegant themes on all of them. Or, hey, you could use DailyNotes on your Tumblr, and then one of their other themes on your Wordpress site. All for the same subscription price of $39/year. Tumblr is a great blogging platform, and when you combine it with beautiful themes from designers like Elegant Themes, you’ll have a stylish and easy to maintain blog. We’re big fans of Elegant Themes, and hope you enjoy their themes as much as we do. Feel free to share your Tumblr or WordPress site with us in the comments below; we’d love to see how others are using these themes. And stay tuned for our upcoming, unique Tumblr blog that we’ll be launching with the DailyNotes theme!